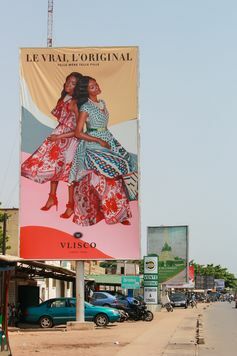 The Vlisco Connoisseurs of Style web guide is designed to help female consumers identify the brand’s markers of authenticity. These include a trademarked monogram, an encrypted bar code, a label, a design number, and the word marks “Guaranteed Dutch Wax Vlisco/Vritable Wax Hollandais Vlisco” printed on the cloth’s selvedge. In my research in Lom (Togo), once the largest textile market for Dutch wax prints in West Africa, I found that consumer evaluations of copies rarely match legal evaluations. Copies are technically pirates according to International Property law. But to buyers they can be both authentic and inauthentic, real and fake.